Q1. When did you write Cambridge Blue? Cambridge Blue was the second detective novel I wrote, I started it in 2001, was unhappy with what I first wrote, so I threw it away and started again. I’m guessing it was somewhere around 2005 when I finished it properly, and it was 2006 when I signed my first fiction book deal. The hardback of Cambridge Blue was published in 2008 and then the paperback in 2010. Q2. What are the best and worst things about being an author? When you are writing a book and you’ll never completely sure that you will get it published, that can be a bit depressing. Once you have a book published in the next worry is whether you can do it again. Most of the downsides to writing go on in my own head! The most exciting thing for me has been the number of people who are getting in touch asking me when book will be out, I find it amazing to hear from people on the other side of the world who are reading and enjoying the Goodhew series. Q3. There is a theory that every writer has an uncompleted novel tucked away in a drawer – do you? If so, why did you abandon it and do you think it will ever see the light of day? I think that theory is especially true when you consider that if is said that most authors’ first books are largely autobiographical. Writing can be a fantastic way of giving ourselves therapy after we’ve been through personal traumas, but I reckon it would be hard to get a novel published that read like a thinly veiled true story. Of course that does happen, but I think the odds are more in your favour with the book that includes original characters, concepts, plotlines etc. When I started my first book I had obviously read quite a few books and took the naive view that writing one probably wouldn’t be that tricky. It was a much, much tougher than I expected and yes, I did start with a semiautobiographical plot. Luckily I have a big fan of crime fiction and chose to embed my experiences within a much darker murder story. And finally, in answer to your question, no it is not tucked away in a drawer, but was published in 2011 as The Calling, the third DC Goodhew novel. Q4. Who would you say is your biggest literary influence? I’m not sure I have just one, I’m definitely as influenced by films and music as by books, as far as I’m concerned they are all means of communicating stories. I grew up on the classics, Christie, Conan Doyle, Ngaio Marsh and Patricia Wentworth. This was at the same time as listening to doo-wop and Rob Orbison and watching TV imports like Starsky and Hutch, Charlie’s Angels and every classic movie I could. I have a long standing affection for Jane Eyre which I read every couple of years. I love Harlan Coben’s, Linda Barnes’ and Lisa Gardner’s books, and British writers including Val McDermid, Mark Billingham, Mo Hader, Stephen Booth and RJ Ellory, whose book A Quiet Belief in Angels is one of the most stunning I have ever read. Q5. I love DC Goodhew, did his character come to you all at once or did it change as you wrote? When I started writing my first book I had an idea but no plans to write a series. The protagonist was a young woman who is stalking her ex-boyfriend and anonymously reporting him to the police. I needed a detective to follow up on this thread of the story and included a young DC named Gary Goodhew, when I needed the police to be involved again I wrote him into that chapter too. Goodhew’s role grew rapidly and along the way the book developed into The Calling as it is now. I was crying as I wrote the last couple of pages and the only character I couldn’t bear to leave behind was Gary. That was the moment I realised I was writing a series! Q6. His grandmother is wonderful, I wish I had a grandmother like her! Was she based on anyone you know? Visually I imagine her as a younger Honor Blackman. She’s a sharp thinker and glamorous in a assured way. She’s obviously a strong woman and supportive of Gary but I don’t think anyone would be too surprised if it turned out she’d had a few wild years in her youth. Q7. You are fantastic at crime fiction, do you see yourself sticking to this genre or is there a different style that you fancy taking on? Thank you. I write the occasional short story that’s not totally crime, but 3000 words seems to be the maximum I can write without feeling like it’s time for a murder. On top of that I have so many crime novels in my head that I doubt I’ll ever run out of crime books I’d like to write. I have worked on a couple of screenplays and I’d love a project like that. – Wine or beer. I’m not a big drinker but maybe the odd glass of white or rose, and once in a while a bottle of Sailor Jerry! – Cats or dogs. Was dogs, now cats. I grew up with dogs but have ended up with three cats and I love them. – Mac or pc. I know how to use a PC better than a Mac, but I have a Mac and love it, I just need to get to grips with the hotkeys to get faster! – Morning or evening. Night time, from 9pm until whenever. I have written through the night many times and often come backs from gigs in the small hours (my husband’s a musician). – Harry Potter or Northern Lights. Harry Potter, the films though because (shock, horror, am I the only one) I haven’t read the books. Q9. Who is your favourite author? I don’t think I have one, some individual books are fantastic and I love Ed McBain and Dashiell Hammett, but if pushed I have to point out there’s only been four times when I’ve read every crime novel an author has written and the culprits are : Agatha Christie, Harlan Coben, Conan Doyle and Sue Grafton. Q10. There are lots of aspiring authors out there and it’s well known that being ‘spotted’ by an agent or publisher is difficult; how did you get your big break? When I finished my first book I went to a writing event where the guest speaker was a top agent for crime fiction, I approached him afterwards and he agreed to read my book. He was very keen and gave me excellent advice on developing the series. If you can get good professional advice then take it, he wasn’t the agent I ultimately signed with, but his observations were hugely helpful and came with the benefit of years of experience in an industry where I was just trying to get my first opening. It was a couple of years later before Cambridge Blue was completed and by then the first agent I had approached had gone off the boil, in addition I also realised the importance of having an agent who helped like somebody you would still want to work with in 20 years’ time and I decided that it would be a good idea get out to events where I could meet publishers and agents face-to-face. I made the shortlist of 8 agents and approached them all. Many agents will be getting a huge number of proposals sent to them each year, in my personal opinion it is a really good idea if they can put a face to a name. What’s even better is if they know from meeting you that you will be an author that will enjoy going to events and promoting their work. When you do approaching agent it’s also good to know who you think your readership will be and how you would describe your work in terms of genre and sub-genre. Sometimes I hear people say “but it’s not really like anyone else’s book”, fact is though that every book need to have something different in order to get published, but can’t be sold if the bookseller doesn’t know where to put it on the bookshelves. Ultimately it may be marketed in a way that is not what you expected, that doesn’t matter, it’s just really good to show that you have a market in mind and you understand that publishing is a business about selling books not just producing art. Q11. Where and how do you prefer to write? I started answering these questions sitting at a table in a holiday camp in rain swept Hemsby as my husband’s band was doing a gig. I’m finishing it in Carrington’s Cafe in Ely. I’ve written on a train, a tube, a boat, in the car, under a table, lying on floor, the trampoline, the bed. Sometimes I even sit on a chair and write at a desk. I’m not a hugely fast writer and I have a lot of other time constraints so when it comes to the crunch I just do it wherever and whenever I can in order to get the story down. Q12. How long did each book take you to write? I had the idea for The Calling in 1989 and it finally came out in 2011. I’m hoping that’s the last time I spend 22 years between having an idea and seeing it published! It took me a long time to work out exactly the right way to do it and in the end I had piles and piles of notes, then when my daughter was a month old I made the decision to finally finish it, that was in 2000 and I finished at the start of 2001. I started Cambridge Blue in 2001 and I suffered from the notorious Second Book Syndrome. I wrote, threw away, re-wrote, threw more away and carried on like this until I think I threw away about quarter of 1 million words to get the final 95,000. By then it was the start of 2006. Book 2, The Siren, and book 4, The Silence, were both written comfortably within a year. Q 13. What is your best cure for writers’ block? Just like writing itself I suspect everyone has their own triggers the writer’s block and equally their own solutions. For me I have discovered that nearly every case of writer’s block is when my subconscious if telling me that what am about write won’t work for one reason or another. Sometimes that means revisiting the scene and tried to tell it from another character’s point of view, or maybe starting the scene from a different point or even scrapping it entirely. Usually when I have identified my underlying concern the writer’s block just disappears. Q 14. What sort of child were you at school and did your English teacher have you pegged as a future author? That’s probably the only time when a schoolteacher has convey to me that I have the ability to write with the impact! Q15. When I finish reading a book that I’ve loved I almost feel a bit bereft as I miss the characters in my life. How do you feel when you’ve finished writing one? As I reach the end of writing a book I always find that my writing speed and hours both increase dramatically. It’s quite typical to have at least 2 overnight writing sessions in the last week. With the last book I was at my desk almost 40 hours the last 48. I finished, went to bed, woke up with a headache, went down with a cold a few days later and all in all felt completely burnt out for about a week. I seem to do this to myself at the end of every book and it’s not because I’m cramming, it’s just that when the end is so close the words just flow into my head… If only they would do that at the very start of the book. Emotionally the feeling is very similar, I have a huge high that lasts a couple of days then a more subdued feeling for the next couple of weeks as I realise that I have to say goodbye to that set of characters in order to work on something else. For an author writing a series they have the opportunity keep all the characters they care about the most, even if the character is initially intended for only one book it is always possible to write about them again if you really want to. Readers of the series will notice a character who appears briefly in Cambridge Blue making another brief appearance in The Silence. Q 16. Where do you get the ideas from for your crimes? I don’t know, I’m not saying that lightly, I’ll have a thought then find my brain jumping around between a whole series unconnected ideas and drawing them together into one story. Lying in the bath helps. Q17. I’ve only lived in Cambridgeshire for 5 months and am still finding my way around, if I go into Cambridge and look for the places mentioned in your book will I find them (are they real)? 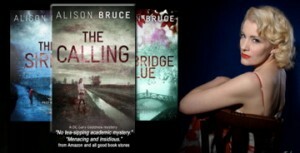 A kind of ‘Cambridge Blue Murder Tour’ if you will! In 2010 I spoke at the library in Downham Market and one of the ladies in the audience particularly liked Cambridge Blue, she belongs to a U3A reading group and suggested that it should be their reading choice. She has now organised a Cambridge Blue Book Walk and this week I will be joining them as they follow the route of the crimes and investigations featured in the book. I use fictitious addresses for murders (I figure that no one wants to read a novel and find out that the murder victim was found slumped across their own kitchen table), but apart from that I aim to give the reader a Goodhew’s eye view of the real city, it is his favourite place in the world and as a boy growing up there he would have experienced it totally differently to most. Q18. What is the best/worst job you’ve had? I’ve had a crazy number of jobs, plenty of admin jobs, taxi driver, IT manager, DJ, electroplater, project manager, dress-maker, film extra, (useless) bar worker etc, etc and every Monday I used to dress as Andy Pandy to run promotions at the local bowling alley. I stopped after 3 months when I was finally told that the outfit was see-through when I stood in front of the fluorescent lighting on any of the lanes. Hmmm. Probably not my best job, but not my worst either. Being a mum is fab but I never feel as though that counts as a job. I love working in a creative field, love mental challenges, love working under pressure. I hate being bored. Q19. What is your favourite TV show? The Mentalist. I love the scripts, characters and neat one liners… oh, and that Simon Baker’s OK too. Q20. You know yourself better than I do (obviously!) what question should I have asked you? Turning the tables on me? You crafty woman, this question asking lark is tricky! Any favourite books on writing you’d like to recommend? Novel Writing: 16 Steps to Success by Evan Marshall. What favourite tips have you been given? Just don’t give up is probably the best but I also like When you write let your heart lead your head, but when you edit let your head take charge. What advice do you have for debut authors? Ask questions and talk to other authors. After slogging away for what feels like forever you secure you first book deal, but that doesn’t mean you instantly feel confident at events or with the writing of the next. Virtually every author has been in the same boat and I think you will find plenty happy to share tips, give encouragement and almost certainly learn from your writing experiences too. If you can get to know other authors with the same agent, publisher or local to you. Her true crime books Cambridgeshire Murders and Billington, Victorian Executioner are both published by the History Press.